Unusual hybrid India hawthorn that you rarely see anymore in our area. Its a great, tough, extremely drought tolerant evergreen shrub. To 4′ x 4′ in 7 years. Waxy deep green leaves emerge a soft pink/amber. In early to mid spring upright clusters of pink flowers are very pretty. They can then occur sporadically all year. Slow growing shrub for full sun and good air circulation. 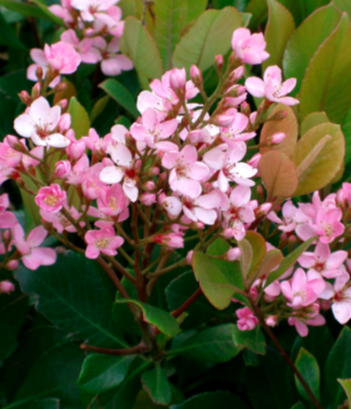 Excellent shrub to combat Rhododendron fatigue in spring. Good looking year round. Accepts regular summer water but thrives on none when established. Useful for blasting hot locations. Easy to grow long lived hardy broad leaved evergreen. Rhaphiolepis indica x Rhaphiolepis umbellata. Nice plant.